What a difference fifteen years can make. At the time of its release, Kenneth Branagh's version of Mary Shelley's Frankenstein struck me as uneven, and worst of all less than horrific. Its recent release on Blu-ray inspired me to watch it again for the first time since its initial release. I was impressed with its emotional resonance this time around, and reminded of just how powerful and horrific the film could be in one particular scene. Having come off of some recent successes with his film adaptations of Shakespeare's Henry V (1989) and Much Ado About Nothing (1993), Branagh was hired by Francis Ford Coppola to direct Frankenstein, a film Coppola originally intended to helm himself as a followup to Bram Stoker's Dracula (1992). Like that film, Branagh's is more faithful to the source novel than previous incarnations of the the oft-told tale. The prologue—involving an obsessed mariner (Aidan Quinn) on a quest to reach the North Pole, even at cost of ship and crew—is preserved for the film. Branagh plays the titular doctor whose hubris leads him to pursue the creation of life from death. In a delirium, Victor Frankenstein encounters the mariner near the Arctic where he recounts his story of his creation and pursuit of a fearsome creature (Robert De Niro) as a cautionary tale to the reckless seaman. This creature was his ambitious attempt to reclaim the power of life from Nature/God. His motivation is clearly delineated in the film which illustrates how Frankenstein comes from a close-knit family, and how the loss of his mother (Cherie Lunghi) during childbirth to a younger brother inextricably ties life and death forever in the mind of the young doctor. The early scenes are quite kinetic, as Branagh elides through much of the backstory to get to the central setpiece of the film, in which the creature is imbued with life by Victor. This sequence is gloriously enacted by the shirtless and well-toned Branagh (the director seems somewhat familiar with hubris himself): running throughout a chamber of scientific gadgets, pulling levers; unleashing electricity biologically through electric eels that swim through amniotic fluid he's collected throughout the past months; bringing life to the relatively sedate film that has preceded this scene. And the creature is born in an unnatural birth where both father and son clumsily slip and slide through the goo, as if to remind us of the absence of a mother—both the creature's and Frankenstein's—emphasizing the circumstances that tie both characters together. Once the creature is born, then the film is relentless in piling up the emotional cost of birthing such an aberration. De Niro plays him as a gentle-hearted man to be pitied, his short life wracked with the pain of not belonging to this world or any other. Creature: You're wrong. (Picks up a flute) Did you know I knew how to play this? From which part of me did this knowledge reside? From this mind? From these hands? From this heart? And reading and speaking. Not so much things learned as things remembered. Frankenstein: Slight trace waves in the brain perhaps. Creature: Did you ever consider the consequences of your actions? You made me, and you left me to die. Who am I? Frankenstein: You? I don't know. De Niro does not forget, however, to demonstrate the monstrous evil that lies within the pitiable creature—a genetic remnant of one of the many sewn human parts from which he is made, it is implied. The most horrifying scene in the film, which I alluded to earlier, is one which begins with the creature stalking Victor on the night of his honeymoon. He has just married his childhood sweetheart, Elizabeth (Helena Bonham Carter), who lays in bed waiting for Frankenstein to return from a short patrol outside of the inn where they stay. The creature falls down through a skylight to land on Elizabeth, justifying the action he is about to take in a whisper to her. He waits for Victor to return before plunging his hand into her chest and pulling out her still-beating heart, brandishing it towards Victor, declaring his revenge. Branagh takes great pains to establish emotional connections and psychological motivations, executing their dramatic payoffs efficiently and eloquently. He punctuates the despair that encompasses the film with moments of humor and horror that grow organically out of the story. And he is not afraid to depart from the original text when necessary, as he does in the final chapters of the film. When he does depart, he pays homage to film adaptations that have paved the way for his treatment, such as Bride of Frankenstein (1935). Yet with all of these disparate elements, the film never feels like a pastiche sewn together to satisfy some commercial impulse. Unfortunately, the Blu-ray does not contain any extras. This is a missed opportunity considering the fascinating genesis of the film, which was rumored to have had Coppola and Branagh arguing over the shape it would take. The picture does look fantastic, and while I don't recommend purchasing Frankenstein separately, I would encourage you to purchase it as part of a trilogy set that also includes Bram Stoker's Dracula, and Wolf (1994), both of which I hope to review soon on the site. I haven't been able to find this Blu-ray set online at Amazon, but I did see it at Wal-Mart for the bargain price of $39.95. Though Dracula is the only Blu-ray in the set to include any extras, all three of these flawed gems together more than justify the price. If they would just go in and remove the *SPOILERS* Helena Bonham Carter becomes a frankenstein monster segment this movie would be alright with me. I remember finding the acting for the first hour to be very campy and underachieving (minus DeNiro) but I may need to revisit it. I think the movie's acting is in keeping with the production design and music, a bit heightened and operatic, but not necessarily campy. As for the scene you would delete? In theory, I think the movie would be more successful at sustaining the inclusion of such a sequence, had it been more fleshed out. The film's pacing feels a bit rushed sometimes. But it didn't bother me so much this time around as it made the movie seem leaner and meaner. 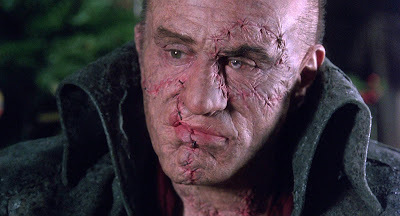 Last year I re-viewed (and reviewed) both films: sadly, I still found FRANKENSTEIN a bit of a mess - I agree with the DeNiro bits but continue to find the creation scene laughable. Happily, the years have been more than kind to DRACULA; I think it's now one of Coppola's best pictures. Hope you get the chance to review it here. It's funny how you and I virtually agree on the tone of the movie, but you view it negatively whereas I view it in a positive light. Over-the-top... yes. A bit indulgent... yes, especially in the "creation" sequence. But I really relished the operatic sensibility, and thought Branagh did a great job telegraphing that this was his aim throughout the rest of the production; for instance, the way he depicted the grand staircase in the Frankenstein family mansion (especially in the scene where he carries the red shrouded body of Elizabeth up the stairs with the long train of the scarlet cloth trailing behind him). There is no doubt that Coppola's Dracula film is the better of the two. But Frankenstein has all of the hallmarks of a lurid B-movie with some above average subtext thrown in, a la Hammer's horror films. So for me, it worked on that level.